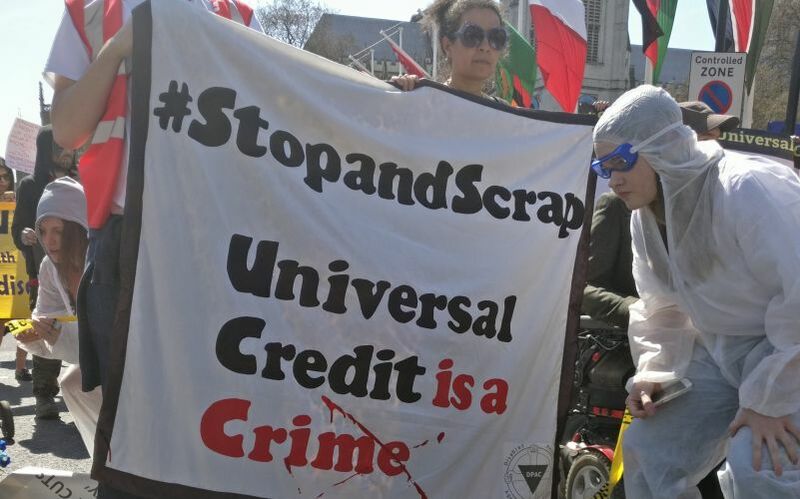 A disabled benefit claimant with high support needs who has lost more than £40 a week after having to transfer onto the new universal credit – forcing him into even greater poverty – has challenged the government to defend its drastic cuts and reforms. Mark Golden, from Yorkshire, estimates that he paid more than £100,000 in income tax and national insurance during his working life before he was forced to leave his job by a serious injury at work. Now the wheelchair-user is having to confront the reality of the impact of the introduction of universal credit on disabled people, after being forced off employment and support allowance (ESA) and onto the new system. The Department for Work and Pensions (DWP) has repeatedly refused to provide details of exactly how universal credit will affect disabled people in different situations financially, insisting instead that more than a million disabled people will be better off by £100 a month under universal credit. But Golden’s case appears to demonstrate how many disabled people with high support needs will be forced into even deeper poverty by universal credit. On 1 December, Golden – who has both physical and mental health impairments – had to move from Bradford to Bridlington so he could be nearer his family, because of his deteriorating health. Because of his change of circumstances, he was told that he would have to move from the ESA support group – and associated disability premiums – onto the much-criticised universal credit. He was shocked to be told that he would receive only £149 a week in living costs benefits on universal credit, compared with £191 a week on ESA, severe disability premium (SDP) and enhanced disability premium (EDP). Out of that £149, he must also contribute £17 a week towards his housing costs. Out of the remaining £132, he must also pay child support (£10 a week), credit card repayments (£20, after having to replace his fridge-freezer and washing-machine), contents insurance (£2 a week), about £6 a week on his mobile phone (he has no landline or broadband), TV licence (£3 a week), gas and electricity (£27 or £28 a week), and £10 a week he budgets for clothing and footwear (he gets through five or six pairs of trainers a year because he drags his left foot). He already has to restrict his use of central heating, only turning it on when the temperature in his flat falls below ten degrees, even though he has Raynaud’s disease, which affects extremities such as the fingers and toes in cold temperatures. This leaves about £50 a week for food and other essentials like toiletries and cleaning products, but that is without the £20 a week he budgets for MOT and car repairs, the £20 a week he previously spent on petrol, which he can no longer afford, and council tax of more than £20 a week he has been asked to pay, which he is hoping the council will reduce. He has been left with a choice of spending his little remaining weekly income on food, heat or transportation. He is likely to have to sell his car, leaving him even more isolated than he is already. He will eventually receive some compensation for the loss of SDP – likely to be less than £20 a week extra, backdated to when he moved onto universal credit – once regulations laid before parliament this week are voted on by MPs. He also receives personal independence payment of £145 a month to cover some of his disability-related extra costs, but he uses this to pay for personal care, provide the support he needs for visits to shops and other busy locations, and to pay for taxis when he is too ill to drive. In a letter to his MP, the Conservative Sir Greg Knight, Golden described both how inaccessible he had found the universal credit process and the impact on his income, writing: “As a constituent of Bridlington I would like to inform its MP of what is happening in his constituency. And how Universal Credits is so unfit for purpose. He told Disability News Service that he wanted the government to explain how it could justify the “dread and high stress levels” caused by the introduction of universal credit, which was leaving him and others with less money and “causing even more hardship and very difficult decisions on what areas you can cut back on in an already frugal lifestyle”. He said this was “pushing people into even more poverty and hardship” and having a “massive” impact on both their physical and mental health. He said: “Over the past few years, disabled people of this country have been made to jump through the government’s hoops to receive what they are entitled to, in many cases going through not only the benefit allocation but also the appeals processes. A DWP spokesperson said: “People can access support online, via our helpline or in the jobcentre and Mr Golden regularly uses his online journal to communicate with the DWP. “In some circumstances, home visits can also be arranged to support a claimant with their claim. She said the government was “committed to supporting people with disabilities and health conditions. “The SDP is not part of universal credit because we have simplified disability provision within universal credit. Despite this, a report by the Commons work and pensions committee suggested last month that even claimants with higher support needs would be worse off under universal credit because of the loss of SDP and EDP, saying that universal credit “does not match what those claimants could have received under the legacy system, with the premia in place”. DWP continues to refuse to say if it accepts this statement is correct. Only last week, the minister for disabled people, Sarah Newton, told her Labour shadow, Marsha de Cordova, that it would be too expensive to find out how many disabled people claiming SDP had been moved onto universal credit since June last year – and in the previous 18 months – in circumstances like Golden’s. Golden will be one of the last recipients of SDP to be moved on to universal credit, at least for several months, as new regulations came into force yesterday (Wednesday) that prevent any further migration of such claimants – apart from those involved in a small pilot programme – until the main “managed migration” process begins next year. Ministers laid this and another set of regulations before parliament on Monday (14 January), following a statement made by employment minister Alok Sharma on 11 January. The other set of regulations – which will have to be approved by MPs – will allow the government to run the small pilot, which will involve a maximum of 10,000 claimants of legacy benefits, including ESA, moving onto universal credit, which will begin in July. The regulations will also provide transitional protection for former recipients of SDP like Golden who have already moved across to universal credit, and those who will do so in the future. But even when these protections are introduced, ministers have previously suggested there will be compensation of only about £80 a month, compared with potential losses for Golden of more than £180 a month. The government will report on findings from the pilot before introducing legislation that will allow it to extend the “managed migration” to a further three million people on legacy benefits, including hundreds of thousands on ESA. The DWP spokesperson said: “The department will be providing a transitional payment to those who have already moved to universal credit who had SDP before they moved and who are eligible. This will be a lump sum and ongoing payments. “The transitional payments are within the main managed migration regulation package, laid today (Monday), which will be debated prior to the pilot, when parliamentary time allows. She added: “The aim of the pilot is to ensure that claimants on all legacy benefits, with a range of differing characteristics, are successfully migrated to universal credit.